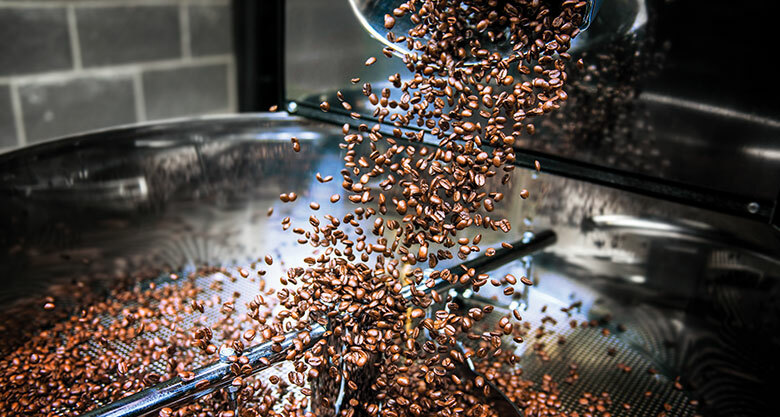 We are fully aware that roasting, like blending, is part art and part science. Luckily, we are well versed in this dark art! Roasting is a skilled process, something which needs to be approached with a great deal of care, love and attention. If not, the results will not be good and nothing upsets us more than a badly roasted batch of coffee. When the green coffee reaches our warehouse, we do not just lump all of them into the roaster and leave them in there for the same amount of time – that would be sacrilegious! It all depends on the specific job that is at hand. No two blends, single origin or seasonal micro-lot coffees are treated the same. Each product is treated individually in terms of roasting temperature, style and profile in order to ensure both quality and consistency. At the end of the process, our high skilled and experienced roasters cool the beans before being subjected to a number of sensory tests. Finally, our continuously thirsty panel of tasters makes sure that the roast’s intended flavour profile has been met. There you have it, exceptional coffee that is always carefully roasted. During the roasting process, the entire makeup of the coffee bean undergoes a transformation. After being picked, pulped and dried, the coffee bean begins life at the green stage and is ready and raring to be roasted. As the beans begin to heat up, their moisture content starts to evaporate. This process produces an alluring aroma of grass and hay that soon morphs into a toasted, grainy scent. After several minutes in the roaster, the bean will start to crack as it expands in size. At this stage, the inherent flavours and other origin complexities are brought to the fore, as are the more acidic notes. Lightly roasted beans are perfect for those wanting a more nuanced cup and as such are suited for single-origin and micro-lot beans that will excel as a filter coffee or as an espresso. As the bean heats up beyond past the initial crack, the sugars begin to caramelise and acidic levels begin to drop, enhancing the body and rounding out the flavours. This profile creates a fantastic multi-purpose roast that lends itself to milk-based drinks such as lattes and cappuccinos but does not completely drown out origin profiles and other unique characteristics. Heading into (and beyond) this stage, the bean's flavours begin to be replaced by those imparted from the roasting process. Body and bitterness will increase, to the detriment of brightness. Typically, a second crack has occurred by this point. The result here is a strong and noticeable coffee that would make the perfect 'Italian style' espresso and still works great with the majority of milk-based drinks. The beans can be exposed to even higher temperatures, but doing so will see certain compounds breakdown and carbonise which will result in the complete eradication of any noticeable flavours - not to mention a potential fire hazard! When a shipment arrives, our in-house experts - working towards an overall profile - will embark on a series of preliminary roasts. Effectively, a period of trial and error occurs until the perfect profile is found. This is recorded and constantly checked to help ensure consistency and to safeguard against any potential deviations. As a general overview, we aim for a light-to-medium profile for the beans that comprise our Speciality range, whilst those that are destined to form our everyday selections would be a medium-to-dark roast. There we have it: carefully picked beans from all around the world are hand-roasted on site, packaged immediately and then sent straight off to our customers. Every variety is roasted individually and handled with care. So, whether you are seduced by the deep flavours of our Fairtrade Java, taken aback by our flat white friendly Super Crema or in awe of the delicate notes of our single origins and micro-lots, you can be assured that we get the most out of each bean. If you want, you could even pop round – we are based on the outskirts of Leeds – and see our coffee roasters in action. However, do let us know in advance! That way we can make sure that there is a coffee waiting for you upon your arrival!